You are currently browsing the tag archive for the ‘gift shop’ tag. Today I tried to teach my child what exploring means. That you don’t necessarily know where you’re going. You’re just going. To a small person who is fully immersed in the “when will we be there?” phase, walking for the sake of walking is a challenging concept. But this morning, she aced it. We left our hotel in search of a breakfast spot. There are many coffee shops in Vancouver, even besides Starbucks, which is just as ubiquitous here as it is in DC, and I am determined to sample them. We found a lovely spot where she had a parfait and I had a prosciutto and egg breakfast panini. They’re into paninis here, which I endorse. Covering one wall of the coffee shop were newspaper centerfolds of Canuck players. I appropriated a newspaper from a nearby table and explained what hockey is and why the people of Vancouver are so excited about it right now. We sounded out the “DROP THE PUCK!” headline on the front cover of the tabloid. Then we walked. 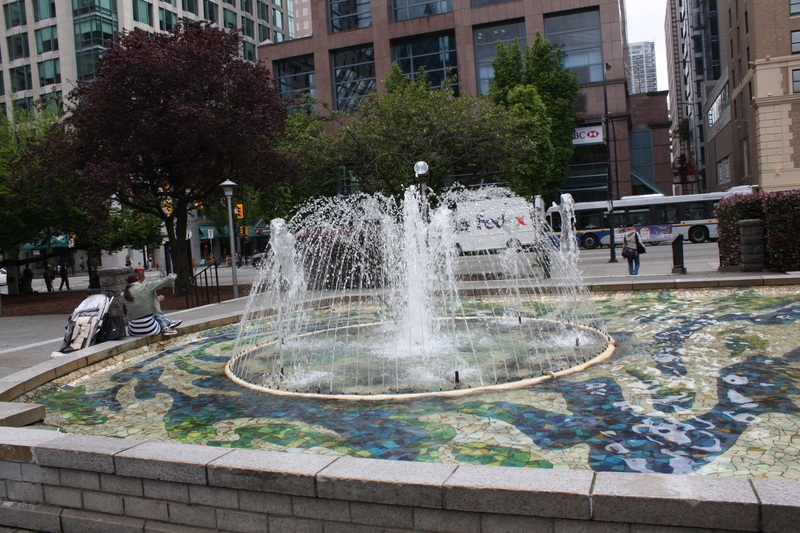 We found a mosaic-tiled fountain by the Vancouver Art Gallery. We spent quite a while in the gift shop of the museum, although we didn’t go into the exhibit because I didn’t want to pay for both of us knowing Zoe would want to zip through it in about two minutes. The gift shop was outstanding (I am a connoisseur of gift shops) and had an extensive section for kids. Zoe found a bowl of cats and played with them for a while. She kept asking me to petsit her cats so she could buy supplies for them, but I was trying to shop. I bought her a book about Rene Magritte, one of my favorite artists, after she had looked at some of his work in the shop. We read it tonight at bedtime and she said she thought his paintings were pretty cool. After that we found more sculptures, an ice rink (where Zoe said she wanted to learn to skate this winter), and many many steps to climb up and down. We were near the court buildings and I saw several men with white judicial collars. We walked down Robson Street and ducked into a few shops. We made our way back toward the water, finding lunch at a market and eating on a bench in Harbour Green Park, overlooking Burrard Inlet. We watched seaplanes take off and land. We watched joggers, walkers, and cyclists go by. Zoe ate an entire apple. Then we checked out the sculptures at the Vancouver Convention Centre before retrieving our car to visit the Vancouver Aquarium. Clearly this last bit isn’t accidental wandering, but a plan made while we were looking out at the water. 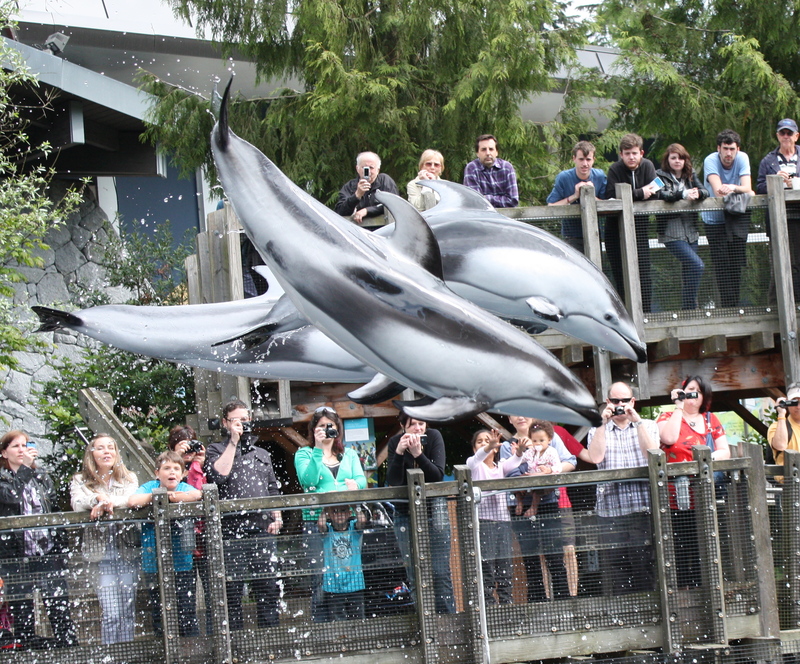 The aquarium was excellent and we saw a dolphin show and several beluga whales. I’ve never before been so close to dolphins or whales, and it was a fun outing. Seeing the dolphin show made up for the fact that we had waited for 15 minutes in line for a 4D movie, and had sat through a public service announcement and the first minute of it when Zoe started sobbing and asking to leave, after having solemnly pledged to be brave (before we entered the theater). She may be extraordinary, but she is still four. I am a planner, and Zoe constantly demands information and answers. So several hours of exploring were good for both of us.